Last Saturday, our Quezon Trip didn’t end at Kamay ni Hesus Shrine. Because we couldn’t go to the Batis Aramin to swim due to the heavy rain pour, we asked the driver if he could just get us into Liliw Laguna to buy shoes and slippers. Life has its ups and downs. And more often than usual, its the mornings that can tell whether you're going to have a good or bad day. 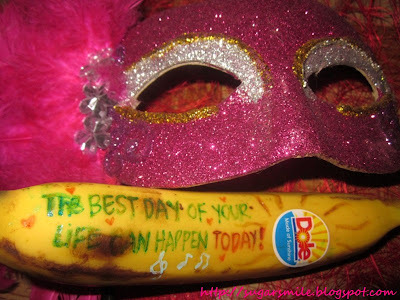 Just as the day begins, we are like wearing a mask. We are finding the perfect outlook to show the world that we can make a difference every single day. Thank God for the long weekend! My Mom has been scheduling a trip to Kamay ni Hesus Healing Center and Church for quite sometime now, but haven't had the time to do so because her schedule doesn't meet with her friends. And then at the last minute, (and with the thunderstorms that is typhoon Mina) our plan finally materialized, just like a miracle. Manila Ocean Park is proud to present "Once Upon an Ocean", a 30-minute spectacle of fountain, laser lights, special effects and animation in one grand musicale. Held at the Acquatica Center, the show is the country's first and largest musical fountain show. If I would have to define fashion, it should always get along with my mood for the day (except when I'm wearing the office uniform). In today's generation, people are bolder when it comes to clothes and accessories they wear, that it expresses their personalities very well. With the influence of the media, we find inspiration in our everyday wear according to our own taste. And now, even comic books and Japanese manga emerges as a trend to the young fashionistas. That is why BUM Equipment invites you to "Reveal Your Dark Side" and embrace the Otaku Culture with their Online Photo Contest. BenQ, released their EW Series of Vertical Alignment (VA) LED monitors this year which includes the models EW2430 and EW2430V. These VA-panel LED monitors' specifications are True 3,000:1 Native Contrast Ratio and BenQ’s proprietary Senseye® Human Vision Technology all on a true 8-bit color panel. 2010 – SOLO launched its first Pinoy Cartoonist Memorabilia featuring Larry Alcala’s “Slice of Life” and its characters in their men and women’s collection and accessories. And because their designs are hip and stylish, it instantly became a hit to fashionistas in the Metro. This year, SOLO is proud to continue their Pinoy Cartoonist Memorabilia Series featuring the work of the Father of Philippine Cartoon, Mr. Tony Velasquez and his popular comic strip, KENKOY. Since Kenkoy was created back in 1929, I’m sure that my grandparents and my parents might have enjoyed reading the said comic strip. The biggest bloggers gathering in Manila came to life once again at the SM North EDSA Cyberzone last Saturday, August 20. With 150+ attendees, this educational event was a success. Hosted by Omar Itay and Flow Galindez, the Blogger Fiesta 2011 was organized by Az Coladilla, with the support of Blogger.com and other participating sponsors. I just love Chinese Restaurants. At first, I thought they all have the same taste and style of cooking, but when I tried Zong at Centris Walk, Quezon Avenue during the dinner for Blogger Manila’s Final Blogger Apprentice Challenge, they definitely set a different trend among the Chinese restaurants I know. Zong’s environment to very cozy and appealing. If you want a place where you can be alone on your thoughts and good food or you’re contemplating where to spend a romantic date, it is definitely the place to be. They also boast of their Executive Sous Chef, Wong Kam On a.k.a.Chef Onno, who shares his Chinese Culinary talent that makes Zong’s dishes truly delectable. Having clear and acne-free skin is important in my line of work. With the clients that I have to deal everyday and the events I attend, a radiant face and aura is definitely a must. 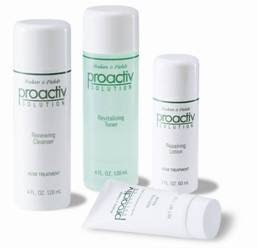 If you think of it, having pimple-free skin is easy if your sleeping hours are enough and do not have enough stress. But for working ladies, it is difficult to follow a proper night regimen. Good thing I found a great solution to fight off my pimple problems. The Finals Night will be held today! Last night, August 19, the conclusion of the Search for the Blogger Apprentice at SM Megamall was held as Blogger Manila announced the "Final 6" of the said campaign. A little background with regards to this event, The Search for the Blogger Apprentice was announced last June among the Blogger Manila Club members. This program was opened for newbie and not so old bloggers to help assist them and bring more opportunities in form of assigned tasks and events. I'm a child at heart. And when I saw the Lego Exhibit yesterday at MOA, I was floored. Especially when they featured the different tourist spots in the Philippines. Way to go to promote Pinoy Tourism! And its fabulous that they made these places from Lego blocks. Ask my officemates where the best restaurants are and they have an answer then and there. But then again, when our boss asked us where he would treat us for his birthday, we only had one place in mind: Panciteria San Jacinto. Entering the restaurant, their homey vibe welcomes you as if you're in your own dining room. Its not quaint and you might bring your family here during Sundays to have good food, in your not so busy pace. Yes, it may be along one of the hectic streets in the Metro, but it is tucked in an old Chinatown charm. Silly me for not updating my blog. Work has been THAT busy with my boss leaving me in a few days and meetings are very important this quarter. And yes, I've been stressed that I didn't have the time to think and write (although there are a lot of PRs in my desk). But today, I'm so happy when my friend Kara brought her pasalubong to me during her recent trip to HongKong. Its cute and its yummy! Its a Hello Kitty Yan Yan! I love watching UAAP during college. Of course, would you even think about what team I'm rooting for? From first to fourth year, we were required (or even if were not) to watch the UAAP Games and support the UST Tigers! 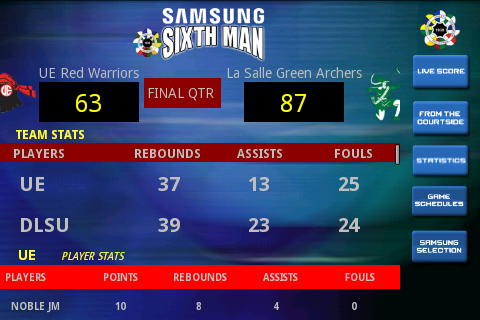 Now that I'm already working, what better way to support your favorite UAAP team than getting the Samsung Sixth Man Application. Its almost as if youre part of the game, while rooting the players from your Alma Mater. Lyda Shyla Roxas and Joel Cruz topped their respective categories in the KWC Philippines national trials held at SM Marikina last July 23, 2011. They earned the right to represent the Philippines in the September 8-10 Karaoke World Championships to be held in Killarney, Ireland. Each of the KWC Champions won a KWC trophy, an all-expense paid trip to Killarney, Ireland for the KWC World Championships, Php100,000 pocket money, a WOW Videoke Concerto edition microphone worth Php19,500, a Sennheiser Freeport Wireless microphone worth Php19,800, a one-year endorsement contract with WOW Videoke worth Php100,000 and the right to become a Talk ‘N Text talent for one year. Gadgets Magazine hosted the Pinoy Blogfest 2.0 last August 5 at the Activity Center, TriNoma Mall. It was an evening of informative discussion with the topic Social Media as an Agent of Change. This whole day rendezvous was supported by Coca Cola Export Company, Teletech, Canon, Globe, Pony, Neo, Asus, Western Digital, Archos, BenQ, JBL, Sennheiser, Manila Bulletin, Business Mirror. I ♥ Mang Inasal - August 1, 2011 - The country's Proudly Pinoy Chicken Inasal Launches its newest endeavors into tapping OPM Music and support 8 Breakthrough Pinoy Artists. 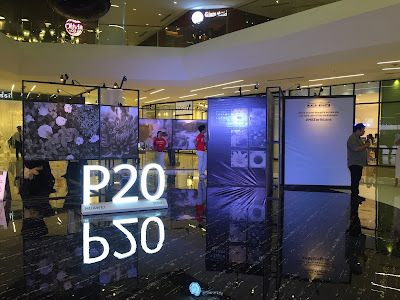 With its fun-filled night full of games, food and music, the T.E.A.T.R.I.N.O at Promenade, Greenhills was well attended by bloggers and media people. Alien sightings here and there is one helluva experience. But nothing gets hotter than being a Nuffnang Blogger. Why? Because being a Nuffie lets you access only the hottest experiences inside and outside the Metro, even if summer was way months over. I just love eating pizza, and I expect that they are hot when it arrives. Good thing, I won't have to worry for there's Pizza Hut HOT ON THE DOT. 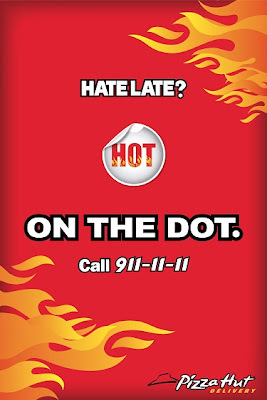 So if you wanna drop it to your tummy while its hot, dial 911-11-11 if you want your pizzas Hot on the Dot! Heads Up for the 32nd Manila International Book Fair! I am always excited when August comes. Why? Because I only have to wait a month for the biggest book fair to hit Manila! Dear Readers, The Manila International Book Fair will happen this September 14-18, 2011 at the SMX Convention Center, SM Mall of Asia, Pasay City. From 10:00AM to 8:00PM, you can get bestsellers, academic and all kinds of books in discounted prices. There are also Special Events that will be held like forums and conferences for Members, Non-Members and Students. With their hundred plus exhibitors, you can surely find that book that you've longed to read. Come to the Manila International Book Fair this September and spread the love for books.